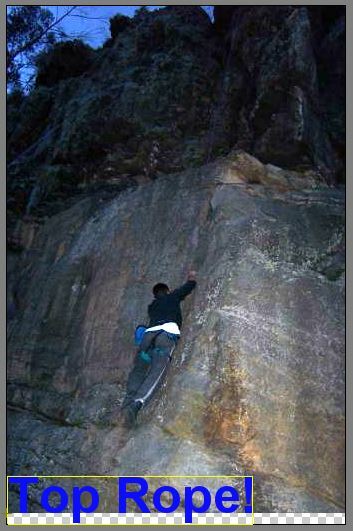 In this PixaFlux tutorial you will learn how to edit and compose images. Create a Reader node . It means that you need to add a node to the node graph. There are 3 ways of creating nodes in PixaFlux. You can create nodes by navigating to the Nodes Toolbar and dragging a node button to the Node Graph Viewport. Navigate to the Nodes Toolbar and click the Generate nodes group button. The Generate Nodes Group Menu is displayed. 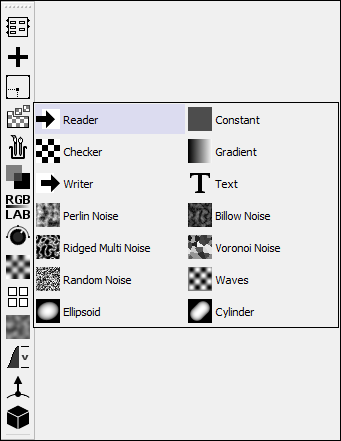 Navigate the Generate Nodes Group Menu and click and hold the Reader node button. Without releasing the mouse, drag it to the Node Graph Viewport. Release the mouse button in the Node Graph Viewport in the location where you want the node to be created. The Reader node is created and set as the Display Node and the Active Node. This means that as the Display Node the images returned by this node are displayed in the Image Viewport, and as the Active Node the Attributes Panel is updated with the attributes of this node. 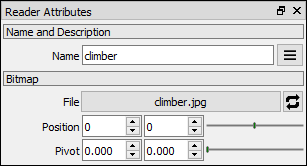 Click the Path button in the Reader node attributes panel and open the climber.jpg bitmap. You can create nodes by navigating to the Nodes Toolbar and clicking a node button. Create a Curves node . 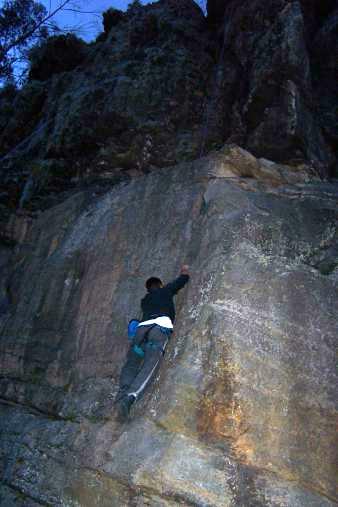 Navigate to the Nodes Toolbar and click the Adjust nodes group button. The Adjust Nodes Group Menu is displayed. Navigate the Adjust Nodes Group Menu and click and release the Curves node button. This action creates a new node next to the right of the current Display Node. If the Display Node has any output of the same type as one of the inputs of the new node the two nodes get connected on that input-output. Since [Reader › image] is a Node Value ouptut of type IMAGE, and [image › Curves] is a Node Value input of type IMAGE PixaFlux connects this ouput-input. In the documentation node inputs are written as [input › Node] and node outputs as [Node › output]. 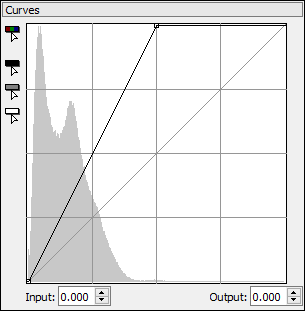 In the Curves attributes panel drag the top-right curve point to the left to emphasize the colours of the image. The Nodes List is a window displayed in the Node Graph Viewport with a list of all the nodes that can be created. Select a node from this list and double-click it or hit enter. In the Node Graph Viewport right click on an empty space below the Curves node. When you see the name of the node you want to create double click it. The node will be added to the node graph in the position you clicked to display the Nodes List. 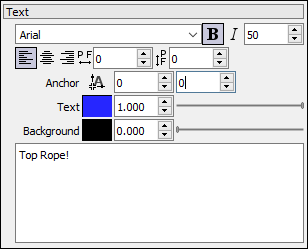 In the Text attributes panel in the main text box type the words Top Rope!. Set the font size to 50 and click the Bold Button. 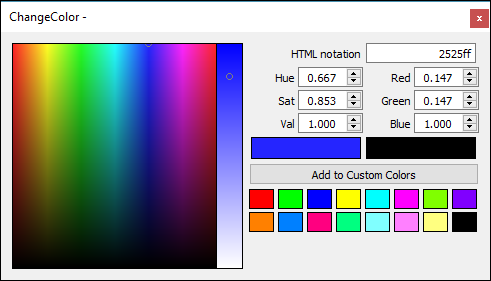 Set the font color to blue by clicking the Text color button and setting it in the Change Color window. You have learned that when you create a node PixaFlux checks the node to the left of the created node and tries to autoconnect the new node if the an ouput of the node to the left has the same type as an input of the new node. This feature can be turned off by holding down the Shift key on the keyboard. Press the Shift key and keep it pressed. Create a Mix node . 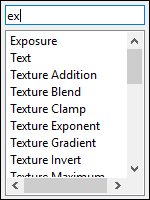 Use any of the methods described on the Create Nodes section. Release the Shift key. A new Mix node is created but it's not connected to any nodes. In the Node Graph Viewport click and drag the node to move it to the right of the Curves node. When you click it gets selected. Selected nodes are displayed with white borders. You can select multiple nodes by dragging a rectangle around them in the Node Graph Viewport. To connect two nodes in the Node Graph Viewport move the mouse to the output of the left node. A connect output cursor is displayed. Click and hold down the mouse button and move the mouse to the input of the right node. While you're dragging the mouse you can see a line being displayed from the output of the left node to the current mouse position. A connect cursor is displayed when the mouse is over the input of a different node and the type of the input matches the type of the connection. Release the mouse to connect the two nodes. The Mix node is a node that receives multiple image inputs and composes them all together. The inputs of the Mix node grow when an input is connected. Connect [Text › image] to the free [image › Mix]. Create a Border node . Connect [Mix › image] to [image › Border]. When you create a new node it becomes both the Active Node and the Display Node. This allows you to edit the node and see in the Image Viewport the updates in real time. To edit a node and see updates on the output of a different node you can set the Active Node and Display Node to be different nodes. Double-click the Text node to make it the Display and Active node. Select the Border node and press the D key in the viewport. This makes the Border node the Display Node. Now you can edit the Text node and see the final composition on the Border node output. 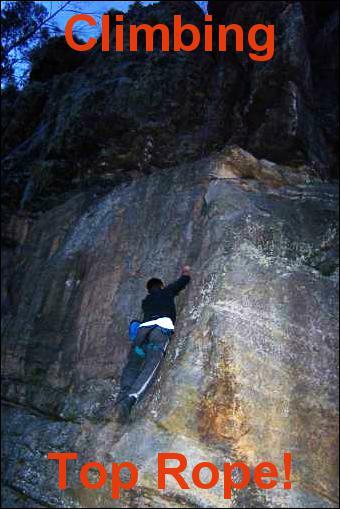 Drag the node in the Image Viewport to the top of the composed image. Change the color of the Text node to give it more contrast against the background. Select the Curves node and click A to make it the Active Node. 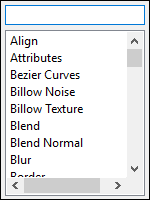 Modify the curve in the Curves attributes panel. Select and move the Text node. Place the new node under the old Text node. Connect the new [Text › image] to the free [image › Mix]. Set the Border node as the Display Node and the new Text node as the Active Node. Drag the text to the bottom of the final composition. Set the old Text node as the Active Node. Change the text to Climbing. In this tutorial you've learned how to create, duplicate and connect nodes and also about the Active and Display nodes.